This full HD 1080 pixel camera can be sited indoor or outdoors as it is designed to withstand the elements. 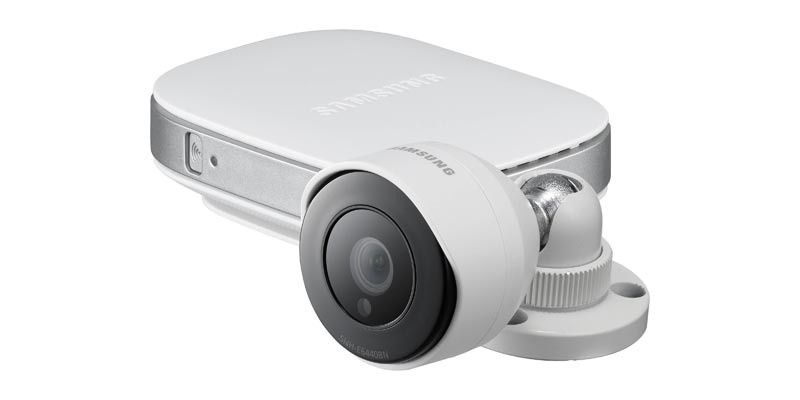 Using Single Band Wi-Fi (2.4GHz) capabilities and night vision, the Samsung Smart Home Camera delivers a home security solution and streams Full HD video to your computer or laptop, day or night, and up to 720p video to smartphones. The camera also has a range of customisable monitoring and notification options such as motion detection and remote alarm. For video storage there is a built-in slot for a microSD memory card up to 32Gb which offers reliable video storage without monthly cloud service costs. The Samsung camera is quick to set up with intuitive operation, it can be set up in minutes even by those who are not particularly tech savvy by using WiFi Direct on any smartphone (whether iPhone, iPad or Android). The SmartCam app is free to download and simple to install so you can launch access remote viewing from anywhere. Video is recorded in 1080p full HD quality using a CMOS sensor to render vibrant colours and detail, so that information such as facial features and car number plates can be recorded in sufficient detail. Placing the Samsung Smart Home Camera outdoors in all weathers is no problem either, as the Samsung is IP66 rated weather resistant so can withstand the cold, dust, wind and rain that is typical of the British weather! The SmartCam HD camera can also be custom set-up for various levels of sensitivity in terms of triggering motion alerts and you can also set-up Motion Zones to fine tune exactly what you want the camera to pay attention to, and you can select up to three individual motion zones as long as they are in the camera’s field of view.